​The 'WRECKING BALL' is a fun, exciting and entertaining attraction requiring skill and strenth. 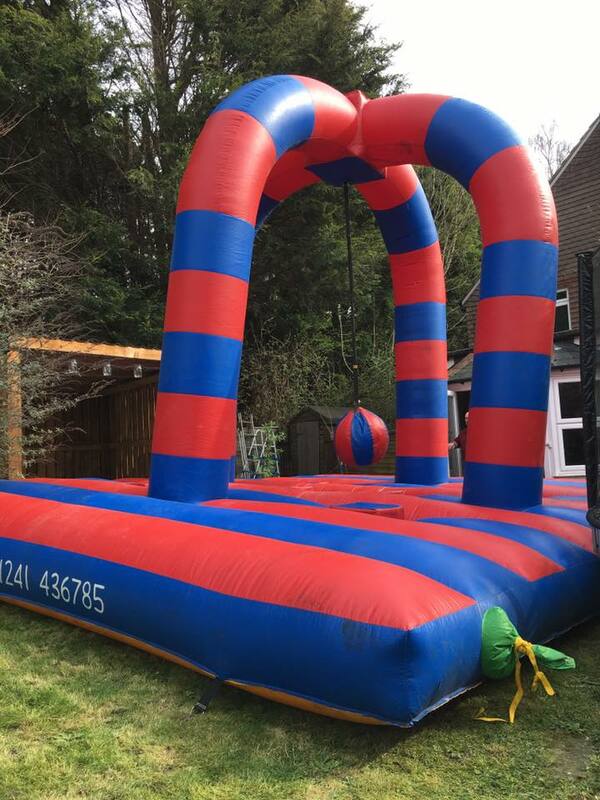 Ideal to have at your Fete, Family Fundays, Parties, School Proms, Graduation Balls, Stag/Hen do, Pub Night and Corporate Event, or just for fun. The 'Wrecking Ball' needs a space at least 20ft (W) x 20ft (L) x 16ft (H) and runs of a standard UK power socket. ​The aim of the game is for users to stand on the padded podiums and swing the 'Wrecking Ball' to knock each other off. Try to dodge the 'Wrecking Ball' and stay on your podium. Last one standing is the winner. (Max 4 users at any one time). Providing great entertainment for contestants and spectators. This unit is suitable for both children and adults. IN THE INTEREST OF SAFETY THE "WRECKING BALL" MUST ONLY BE USED FOR 4 CONTESTANTS AT A TIME. THIS UNIT IS NOT A BOUNCY CASTLE AND MUST NOT BE USED AS SUCH. 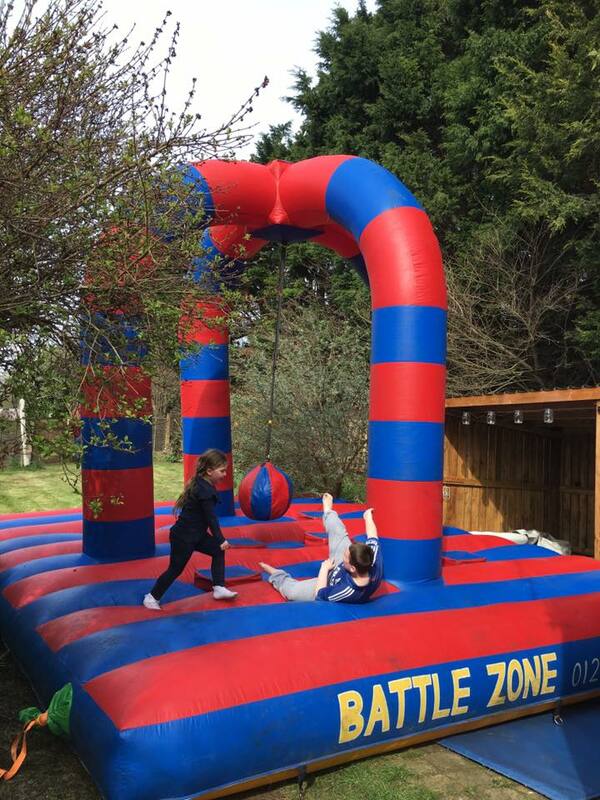 The 'GLADIATOR DUEL' is a fun, exciting and entertaining attraction to have at your Fete, Family Fundays, Parties, School Proms, Graduation Balls, Stag or Hen do, Pub Night and Corporate Event. Two contestants climb onto the inflatable GLADIATOR DUEL base wearing their padded safety helmets, pick up their large padded pugil stick. Then just like on the hit 90s TV GLADIATORS Show, the aim is to knock your opponent off their podium. Providing great entertainment for all spectators. The GLADIATOR DUEL will need a space at least 20ft x 20ft and runs of a standard UK power socket. This unit is suitable for both outdoor and indoor use. 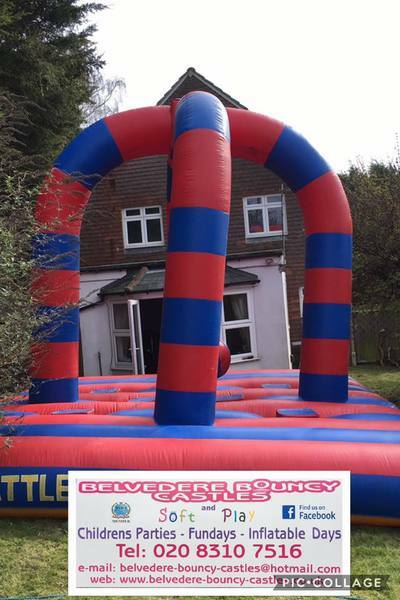 Belvedere Bouncy Castles will deliver, set up and explain how to use the equipment, then collect at the end of the agreed hire period. Belvedere Bouncy Castles can supply a referee (*at a moderate additional charge). IN THE INTEREST OF SAFETY THE GLADIATOR DUEL MUST ONLY BE USED FOR TWO CONTESTANTS AT A TIME. 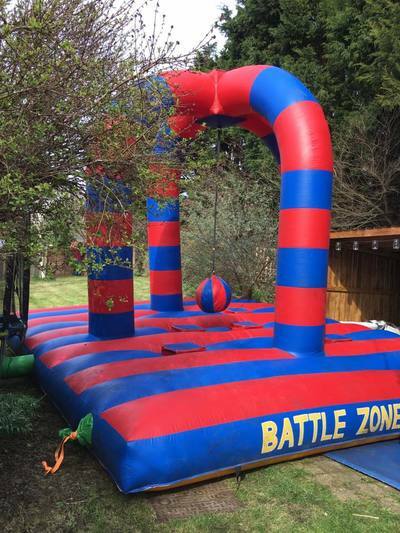 THIS UNIT IS NOT A BOUNCY CASTLE AND MUST NOT BE USED AS SUCH. PILLOW WARS adds an extra element of skill and competitiveness as you need to keep your balance up on the pole. PILLOW WARS is an amazing game that will have your guests queuing up to challenge their friends, family and colleagues in a friendly game. Armed with a ‘pillow or boxing glove’, you’ll need to first climb onto the pole and take your position - sounds far easier than it looks! Once you’re ready, let the battle commence as you repeatedly try to knock your opponent from the pole and onto the soft inflatable bed. The PILLOW WARS Inflatable is suitable for children of all ages from 8 to 80, who can compete against their friends or siblings in an attempt to become PILLOW WARS champion. PILLOW WARS will have everyone lining up eager to bop and bash their opponents onto the inflatable bed. The PILLOW WARS inflatable will need a space at least 14ft x 12ft and runs of a standard UK power socket. IN THE INTEREST OF SAFETY THE PILLOW WARS MUST ONLY BE USED FOR TWO CONTESTANTS AT A TIME. THIS UNIT IS NOT A BOUNCY CASTLE AND MUST NOT BE USED AS SUCH.